For Lady Gaga, making news with her outfits is old hat. But when she wore a unique piece of jewelry to the YouTube Awards this month, it gave one struggling entrepreneur a much-needed lifeline. Gaga wore a bracelet -- which looks like fake teeth -- in her mouth, creating an immediate stir. "I immediately called my parents when I saw a photo of her wearing it," said Danielle Hills, 25, a New York-based jewelry designer who created the $180 cuff bracelet. Hills said someone from Gaga's style team requested a few pieces of jewelry for a photo shoot this summer. "Everything was confidential. So I didn't know if my pieces were eventually used or not," she said. Not only did Gaga wear it for the YouTube awards, but she's also sporting it on the cover of her new single "Dope" -- also as a grill over her teeth. "That was really unique," said Hills. "I always want people to be creative with my pieces." In the week since the awards show, Hills has scored $2,000 in sales from new orders for the bracelet. It's boosted demand for her other pieces, too. It was a welcome surge, as Hills' business hadn't seen any sales in the past few months, and she has $30,000 in debt. "Seeing the bracelet on Gaga is a little spark of hope to keep my business going," she said. The celebrity effect isn't a new phenomenon. Designer Claire Pettibone's sales jumped 300% after Mark Zuckerberg's bride-to-be wore her dress for the wedding. And when 9-year-old Quvenzhane Wallis took a puppy-shaped handbag to the Oscars as a nominee, bagmaker Poochie & Co. sales shot up by more than 25%. Hills started her design company Gilding Primal Instinct in 2010, funding it with her own money and loans from family and friends. Hills' pieces, made from metals like bronze, copper and silver, are bold and a little intimidating. 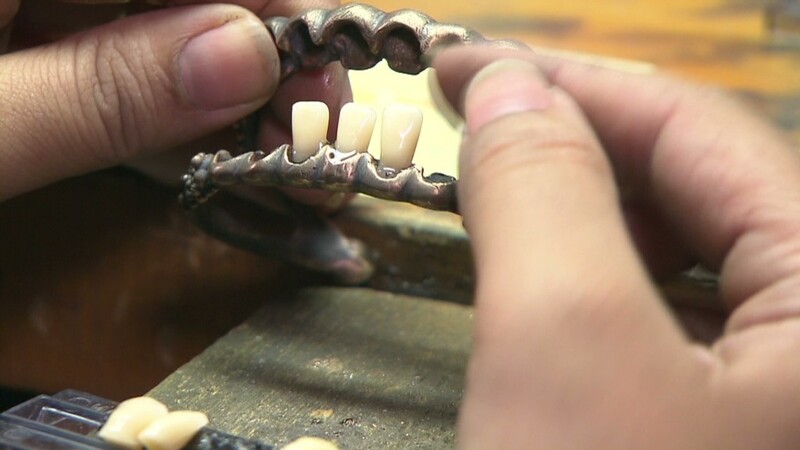 The teeth bracelet is one of her earliest designs; others feature a swinging blade pendant, fingertip rings shaped like talons and cufflinks featuring acrylic molars. "I'm inspired by visceral human behavior," she said. "It's iconic archetypes such as the hunter and the executioner." Still, Hills admits her jewelry, which she primarily sells online, isn't for everyone. "Lady Gaga would actually be an ideal client," she said. At times, her artistic vision has come in the way of growing her business. "People like to talk about my pieces but few wear them." And she said loyal customers tend to keep her information close to their chests because they don't want others sporting the same talons or teeth. Despite the recent Gaga-generated sales of her jewelry, Hills said the business is still on shaky ground. In August, she took a full-time job as a makeup artist to help pay her bills. "I don't think the Lady Gaga publicity can single-handedly turn things around for me," Hills said. "But it's a great opportunity that I hope will lead to other opportunities."